It should easy to apply. It should dry in reasonable time. It should not crack while making thin film and after dry. It should have smooth surface and durable as long as possible so that it couldn’t affected by atmosphere. It should not be harmful to the health of workers. It should possess attractive and pleasing appearance. It should cheap so availability is possible for all. 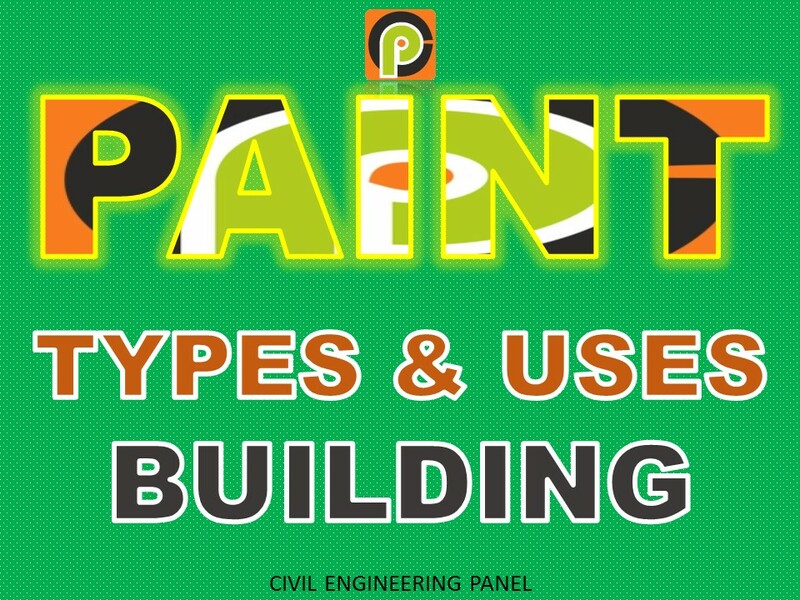 Emulsion types of paint is mostly used for walls and ceilings. It contains binding materials such as polyvinyl acetate, synthetic resins etc. It is water based so smell less and dries in 1 to 2 hours and it is easy to apply. It is more durable. PLASTIC PAINT and ACRYLIC PAINT are very used in this types of paint. Royale Paint are mostly used on exterior face, which reflect royalty and luxuries effect. Royale Emulsions won’t lose their grace and class for more than 7-8 years. It contains white lead, oil, petroleum spirit and resinous material. The surface provided by it resists acids, alkalies and water very well. It is desirable to apply a coat of titanium white before the coat of enamel is applied. It can be used both for external and internal walls. These paints are applied in three coats-primer, undercoat and finishing coat. The presence of dampness while applying the primer adversely affect the life of oil paint. This paint is cheap and easy to apply. It is available in powder form. It consists of white cement, pigment and other additives. It is durable and exhibits excellent decorative appearance. It should be applied on rough surfaces rather than on smooth surfaces. This type of paint is manufactured by dissolving asphalt or vegetable bitumen in oil or petroleum. It is black in colour. It is used for painting iron works under water. This paint is prepared from resins. It dries quickly and is little affected by weather and sunlight. It resists chemical attack well. This paint may be applied even on fresh concrete. Its cost is moderate and it can be applied easily. It contains finely ground aluminium in spirit or oil varnish. It is visible in darkness also. The surfaces of iron and steel are protected well with this paint. It is widely used for painting gas tanks, water pipes and oil tanks. Anti corrosive paint contains red oxide, lead or zinc chrome to resist the corrosion. It is cheap and easily available. Mostly used on Rebar or Structural steel in construction projects. The essential Ingredients of paints are Base, vehicle, pigment, drier and thinner. Base: It is a principal constituent of paint. It also possesses the binding properties. It forms an opaque coating. Commonly used bases for paints are white lead, red lead, zinc oxide, iron oxide, titanium white, aluminium powder and lithophone. Vehicle: The vehicles are the liquid substances which hold the ingredients of a paint in liquid suspension and allow them to be applied on the surface to be painted. Linseed oil is very commonly used vehicle. Tung oil and Nut oil are also used as vehicles. Pigment: Pigments are fine particles which gives required colour to paints. Black – Lamp black, suit and charcoal black. Red – Venedion red, red lead and Indian red. Green – Chrome green, copper sulphate. Yellow– Ochre and chrome yellow. Drier: Drier is used in the paint to quick dry the paint after apply. It absorb oxygen from the air and supply it to the vehicle for hardening. The drier should not be added until the paint is about to be used. The excess drier is harmful because it destroys elasticity and causes flaking. These are the compounds of metal like lead, manganese, cobalt. Thinner: Thinner or solvent makes paint thinner. So it spread easily and cover more area. Terpentine and neptha are commonly used thinners. After paint applied, thinner evaporates and paint dries.